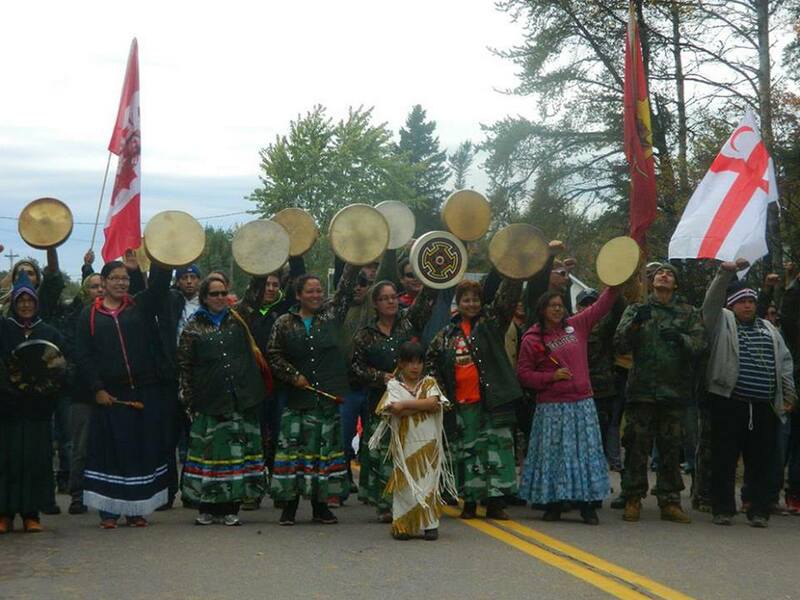 On October 17th in the Canadian province of New Brunswick, an indigenous Mi’kmaq community named Elsipogtog came under RCMP militant attack. This community learned many months ago that there were corporations preparing to explore for gas trapped by shale that industry would “frack” to release. When land defenders from their community learned of the multiple places around the continent that have seen everything from polluted aquifers to tap water that could be lit on fire as an outcome of fracking– concerned families took action to defend their water. Among the means by which people took action included blocking access to the site of exploration and all the seismic testing equipment to be used by SWN Resources on the site. The community began mobilizing months ago; a blockade had been up for over three weeks. It changed last Thursday. The RCMP swooped in a community that has never ceded their land via treaty to either Canada or the British Crown, with multiple dozen armed officers coordinating an attack on an encampment of shocked and terrorized Mi’Kmaq people and their supporters. RCMP had stated against just such an act only the night before. After breaking the blockade up and arresting over 40 people– and then holding the obligatory press conference to smear those they had attacked– the RCMP discovered that as of Monday, October 21, 2013 the injunction demanding the road to be evacuated was overturned and tossed out. In between the initial attack on Mi’kmaq defenders and their supporters and this throwing out of a legal case for attacking people, a rhetorical case for white supremacy dribbled into the microphones of Sun News. Ezra Levant, perhaps the best known name and certainly loudest advocate for forcing you to watch the Sun News Network, held his own version of reality forward on his show, fortunately mostly only seen online. After assuring people watching that “no lethal force was used” (thus making state violence against families with children and elders apparently more acceptable), he also asserts the community (never named as such) are “terrorists.” He explains that the fracking process is “quite normal” and makes some other real humdingers as far as assertions about just that. Sun News Network has been compared to a hypothetical “Fox News North,” and you can see this would-be Bill O’Reilly ranting, screaming and slandering people in much that same “tradition.” It comes from the ideological far-right– the environment hating, white supremacist mish-mash of people who think all industrial development and profit is good, any person of color is a likely criminal, and that any regulation of industry is tantamount to Stalin’s Five Year Plan for Canada. …the next thing, of course, is to call Mi’Kmaq terrorists, and use the racist dehumanization he often carries out against Palestinian men, women and children to help with the dehumanization of Mi’kmaq men, women and children (Hey, it wouldn’t be Ezra if he could not find a way to bash at least one Muslim population, somewhere). Certainly lost on him would be the bigger link between the two communities, attacked as backward while settlers from across the planet take their land and homes. Both Palestinians and indigenous peoples in Canada have human rights law and even UN resolutions on their sides. This, of course, is irrelevant to Levant and is ignored by mainstream media as a matter of course. Then, from vile and racist, Levantine logic jumps to the ridiculous. Further to that point? All of the major foundation funded ENGO’s in British Columbia, Canada have not opposed the construction of the Pacific Trails Pipeline proposal, now owned by Chevron. This particular pipeline would be the first major exporting pipeline of fracked natural gas of the many planned, running from “Canada’s Bakken” in the Horn River Basin of Northeastern British Columbia and southwestern North West Territories. This is an area with a breakneck pace of development that has flattened large tracts of land and yet has only just begun so far as industry would decide. That fracked gas could also be fed into the energy grid of Alberta province, lowering the price for tar sands producers to refine, upgrade and ship their tar sands climate killing crude oil. The proposed pipeline route of Pacific Trails would be, so industry likes to think, the means for laying down major new tar sands pipelines as well. The end of the Pacific Trails would be a major, highly dangerous Liquified Natural Gas terminal on the Pacific Coast where currently super tanker traffic is neither allowed nor would ever be safe. The same dynamic exists in the community near Rexton, NB. While fracking is being resisted by land defenders who want water for their families, well-funded and connected environmentalists have had almost zero to do with putting the situation on the political map. The community didn’t need outsiders from gas and energy to tell them they needed good water, and they didn’t need that from “environmentalists,” either. What they have needed is no-compromising support, and in the moments since the RCMP attacks they have received such– from other indigenous nations across the entire territory colonized by Canada. Foundation Funded environmentalists and their “we don’t oppose fracking” organizations? We have Tzeporah Berman’s outfit over at the “Tar Sands Solutions Network”. In the four days as of this writing since the RCMP attack on the community in New Brunswick, only one story that was even somewhat related to the struggle on Mi’kmaq Territory is listed– the recent cancellation of the NEB hearings on a possible Line 9 Reversal to accommodate tar sands oil exports to the Atlantic Ocean. That happened after a flurry of opposition to Line 9 was expected to jump dramatically– in the wake of furious organizing for just that, and that had taken place in the day following the assault on Elsipogtog. The reasoning behind the ad? 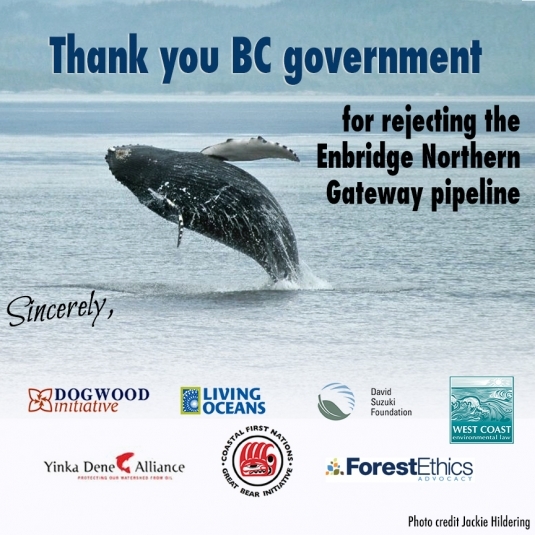 In recent BC provincial politics, more than 4 out of 5 people have stated opposition to the Enbridge Gateway Pipeline, and majorities has been opposed to tar sands-sourced oil coming into BC in general. To avoid taking a pro-industry position that would cost her votes, prior to the May election in BC, Clark’s Liberal Party endorsed “conditions” that “must be met first” for the pipeline. After winning the election, Clark repeated some of those conditions and stated at least temporary opposition to the project. The provincial government has no final say in the Joint Review Panel; the pipeline in Canadian law is a federal matter. The BC government is “just” another “intervening party.” Stating opposition is free, intelligent public relations for the re-elected Liberal Party, especially while “conditions” exist to be met and a “rethinking” can about face later. In the same time frame elsewhere, with another indigenous community struggle against another fracking proposal carried out by another advocating Premier, Big Green has done little or nothing to support the struggles that have now taken on a larger scale impact. And how does the Sun News Network’s great white hope describe this? Again, in Levantine fashion, the description is of indigenous peoples being marched by Big Green, at the behest of Big Capital, to disrupt the Canadian economy. Why big capital would be anti-capitalist is not explained. The notion that everything was fine months ago, and that conflict is fabricated by shady, American money is casting a white supremacist conspiracy theory. That only white, rich “Americans” would try and prevent fracking in traditional Mi’kmaq Territory of course, is just silly. That this struggle against fracking has developed outside of foundations and Big Green directing struggles in a breath of welcome, fresh air would make Levant’s head explode. As a result of Big Green ignoring such struggles against fracking, it has taken means such as land defense from Mi’kmaq community members to make fracking a known issue in Canada. It has been, on both coasts, the impacted communities that dared to organize to defend their land and water when there was little to no help coming from Big Green. If such struggles continue, watch for Big Green to take up exactly this issue, after the fact. Perhaps the only part that is correct about this twist of logic is that movements in environmental circles are often trying to borrow the legitimacy of indigenous land defense. Certainly it is the case that indigenous imagery gets used as a means to lessen the whiteness of environmentalism in the public mind. However, who struggles first and who shows up later to use that for their own purposes is the same as always. Community leads the way, organized institutional groupings– whether “progressive politicians” or “progressive environmental groups”– will attempt to hitch their cart to a running horse. Big Capital has invested huge sums to try and corner the public perception of what constitutes environmentalism. When struggles break out into open confrontation, it is a community that did not take a deal, cut and run to private boardrooms and the like that is almost always the catalyst. If the struggle built by community has staying power, soon capital through foundations will try to stake their claim within said struggle. The near total silence on fracking from Big Money’s Big Green illustrates this perfectly well in Canada’s indigenous land defender communities. 2: More specifically, your arguments have much in common with Canada’s would-be Rush Limbaugh or Vivian Krause, ranters and researchers beloved by the growing authoritarian right in Canada who regularly assert a “green conspiracy” that equates environmentalism with something akin to Black Helicopters from the UN turning cows inside out in Kansas, but at the behest of a reinvigorated Kremlin helping the Saudis and Iran. Despite the fact that for decades Big Green all but ignored the tar sands developments until they became an international issue after the alarm was raised by effected communities in Alberta who tied it to climate justice, Levant posits that people do not actually oppose tar sands developments, but that media have been brainwashed into believing such through the largesse of Obama-loving liberals in the US. This basic premise by Levant, Krause or any of the other people attacking right wing Big Green groups from even further to the right, always puts the cart before the horse about how big money got involved. The reality is that Big Green came when climate called, that is a campaign with international appeal and therefore the possibility to play a “deciding” role presented itself. But it was community organizing that built up international concern from decades of being overlooked. Big money liberals have moved to steer what cannot be stopped; Big Green has shaped policy that beckons for solutions in tune with a nascent green bourgeoisie. Of course ‘paranoia’ over such an analysis may be invoked by those who would defend Big Green, actual facts be damned. That large money crosses the border is about the only point Levant and co. get right; The Tea Party-inspired thought fails to see that this liberal strategy defends capital more effectively than their hardline opposition, just as similar thinking fails to see the bailout as boon for capital and industry. Those who call the Obama regime ‘extreme left’ are incapable of embracing this fundamentally soft right wing, carrot instead of the stick approach. They refuse to join them– and cannot recognize that by instead attempting to beat them they are beating themselves. The false binary– “The left and the right have similar criticisms of environmentalism. The truth must be somewhere in the middle!”–has been used as a mantra for the liberal Big Green elite to dismiss a discussion of the subversion of real grassroots environmentalism and the choking of community level democracy that gave birth to environmental activism (and many of the Big Green groups) in the first place. This right-wing ideological contempt for malleable, corporate friendly eNGO’s is the same sort of mentality that attempts to diminish the role of the United Nations, to use government “shutdown” blackmail to prevent modest re-regulation of the private-for profit health insurance sector in the United States, that cheers Canada’s “number one friend” relationship with Israel while eliminating all diplomatic ties with Iran. All of it is more ideologically based than it is rational policy. The primary critique from the Levant and Krause camps have surface colour, but the thesis– That American environmental money is trying to destroy the Canadian economy– has zero depth. Large capital acts in its best interests, and always has. There is no “American takeover” through a hostile, anti-Canada campaign of US philanthropy; There is a continent wide takeover by capital through the dismantling of an accountable public process. The problem of free trade deals is the considered increase in deregulation and lack of accountability that results from them. The same is true of taking environmental planning processes out of the public sphere. It matters not whether it is Canadian or American corporations decimating the atmosphere; it matters not whether it is Canadian or American capital that squashes democracy inside a secret negotiation process around tar sands. There is no Saudi-orchestrated attempt to knock “ethical oil” off the market to the advantage of the monarchs who run the Gulf-Cooperation Council states, either. Nor is the Foundation-led leadership contemptuous of the environment itself, working with personal intent to decimate the biosphere. They are capitalists, some of whom love green spaces and desperately want a false green capitalism to “give it a go.” The problem is not that they insufficiently care about the environment. It is that they love their class privilege too much. For the most part, while the “invisible to the outside” coalition will not allow for transparency, inside them are vast structural realities in terms of class, race and a complete lack of agency inside the now essentially authoritarian Big Green movement; This causes the policies, direction, media talking points and vital strategies to be so overwhelmingly pro-industry and 100% pro-capital. Sometimes the capital slant would show in which groups get the largest funding or the most media push; Lawsuits that attempt to “fix” regulatory issues, or ENGO-driven ad campaigns in large newspapers can garner huge chunks of the budget and direction of any such coalition. Organizations that represent indigenous and/or frontline communities or that reject any and all false solutions– such as carbon credits– may get enough money to become reliant and dependent, but not enough to change the over-all trajectory of anti-tar sands “mainstream” policy direction. And whether it is fracking, tar sands, privatization of river systems or mining on ancestral lands, the actual concerns and sovereign rights of nations in the way of environmental schemes are given the same level of respect as indigenous land is by industry. It is only accommodated when it does not disrupt the agenda, and that agenda is already pre-determined to be within the confines of what the current economic structures abide. A democratic and anti-colonial environmental movement is the only answer; the answers needed immediately cannot come from within structures built by capital and structured for market-based incentive solutions. Only when community resistance speaks truth to power, as has been witnessed in Elsipogtog for the last several days, can the voice of democracy be heard– and when it is heard, it speaks with more clarity and simple truth than capital can handle.